Recent years the price of flat plate collectors has dropped while the price of vacuum tube collectors seems to have risen somewhat. One explanation for this may be that most of the less established companies engaged in "garage imports" from China have now disappeared, while those companies working with high-quality vacuum tubes are left. The price decrease of flat plate collectors is mainly explained by the price developments in Europe. During 2014, the marked for solar thermal collectors dropped rapidly. The selling of vacuum tube collectors dropped with 34 % and of flat plate collectors with 18%. The statistics also show that the sales in the first two quarters of 2016 was not as strong as the sales for the same period in 2015. Typical applications in Sweden are combined domestic hot water and space heating systems in single-family houses, multi-family houses, often in combination with solid wood boilers (i.e., wood chips, logs, pellets, and briquettes). You can also find solar heating in small district heating systems, and combinations of solar collectors and heat pumps in, for example, single-family houses. The Swedish building code indirectly promotes installing solar energy that is located on or integrated in the building. The calculation of the energy performance includes the solar energy that is used in the building. Some tax deduction for repair, conversion and extension work can be made for installing solar heating systems, which can be considered as an indirect form of governmental subsidy. Key barriers are the lack of direct financial support, the lower prices of alternative energy technologies and the lack of information on solar heating systems among actors and consumers. A main competitor in the small systems segment are heat pumps which may or may not be combined with PV systems and for large systems district heating (including combined heat and power generation) based on, for example, solid wood fuels, municipal solid waste, and industrial waste heat. 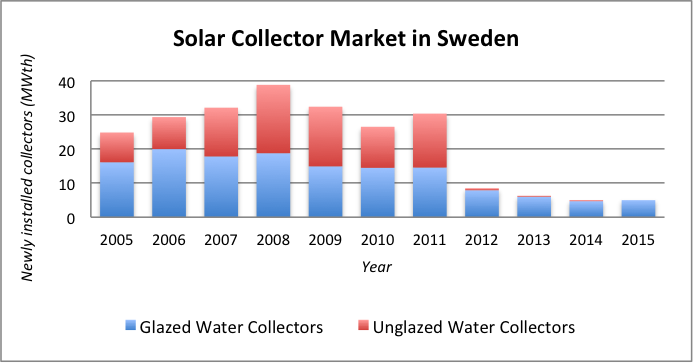 In Sweden, there are a few solar collector manufacturing companies, which cover about 50% of the domestic collector market, and one single absorber manufacturer that exports. Different approaches are used to market the systems, but mainly this is done via the installers. Estimates from the Swedish Solar Energy Association suggest that there are around 60 jobs (full time equivalent) in Sweden related to the solar thermal industry, including installation and related service (testing, etc.). The assumption is that 100 m2 of collectors installed will create 1 job. The costs for small systems are in the range around 5,000 Euro (5 m2, 300 litre) and the large systems are in the range from 300 - 1,000 Euro/m2 (excluding VAT) depending on size. A key topic for the industry is the absence of governmental support or subsidies for solar heating systems. Another key issue is the competition from solar PV systems, heat pumps and district heating. The focus in Sweden is on low-energy buildings and nearly zero-energy buildings. There is no separate focus on solar buildings, however, several low-energy or nearly zero-energy buildings are equipped with solar energy supply systems. The main drivers for low energy buildings are local policies of municipalities and companies who want to reach ambitious energy and environmental targets. There is no separate information on solar buildings. No national R&D program is entirely and specifically devoted towards solar thermal energy. There is, however, a broad research and innovation program within the energy and construction sector where solar heating projects can be funded. The Swedish Energy Agency runs the program in collaboration with various partners in the construction sector. Some innovative hybrid collectors have been developed in Sweden. Energy goals/targets for Sweden are stated in the Government’s integrated climate and energy policy bills from 2009. The goals include energy policy targets by 2020, including a 40% reduction in greenhouse gas emissions, at least 50% use of renewable energy, and a 20% more efficient energy end use. Also, the use of fossil fuels for space and tap water heating is to be phased out by 2020. There are no specific and quantitative energy policy targets directly related to solar heating. At the same time, there are various policies (national, local and commercial) and measures that can influence the development and implementation of solar thermal systems. The main agency is the Swedish Energy Agency, www.energimyndigheten.se/en/. There are no direct support measures for solar heating, but there are several indirect measures like taxes on fossil fuels and energy efficiency requirements for new buildings. For solar buildings, the main incentive can still be considered to be local energy and climate policies set by the municipalities. A generally applicable tax deduction is possible for all refurbishments, rebuilding, and add-on building, including solar thermal systems. This subsidy can give up to a 30% reduction in labor costs for installation and connection of solar panels and associated equipment. Labor costs are generally 30% of the total investment cost, including VAT. The tax reduction is then 30% of this amount. Monthly magazine that covers economics and technology relating to production, distribution and use of electricity, heat and steam nationally and internationally. The magazine is aimed primarily at decision-makers and other energy experts in the energy business, industry, municipalities, government agencies and universities. Their main target group includes professionals in the energy business, energy-intensive industries, energy advisors, consultants, etc. The Solar Energy Association of Sweden (SEAS) has a co-operation with the journal. Monthly magazine that informs on the development of heating, ventilation, indoor climate, plumbing, refrigeration and energy technology. Readers consists of industrial executives, consulting engineers, building services contractors, wholesalers, builders, real estate administrators and employees at official institutions and companies, governmental and municipal authorities. Sweden’s largest technology and IT newspaper and publishes technolgy news, product trends and innovations. The newspaper reports every week on growing sectors such as IT, telecom, energy, biotechnology and how new technology is being used within industry. Industry's leading news magazine and is published every week. The newspaper includes reports and articles on technology, housing, building materials, finance, and architecture. The Swedish Energy Agency's magazine and is published five times a year. It is aimed at anyone interested in energy issues.